✔FESTIVE DECORATION and PERFECT GIFT - MULTI COLOR makes the lighting effect more fasinating, engaing and apealling to your space. It creats romantic and pleasant vibe for your place. It can be the perfect GIFT for your families and friends. ✔Easy to Install and Use with Built in Push Button Dimmer for 8 Light Mode and one stake. ✔Bright LED Solar Lights - Built-in rechargeable NI-MH battery, eco saving, recharge and light up automatically. 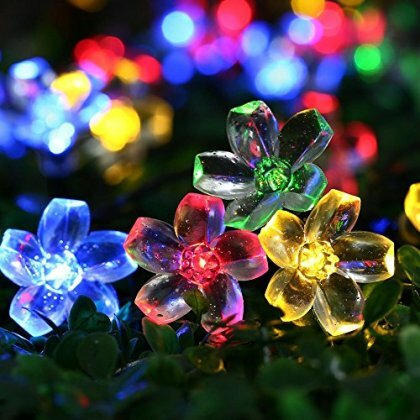 ✔ Low Voltage &Waterproof For All Conditions- Waterproof 50 LED string lights decorates garden, patio, walkway, grass, fence,add romance atmosphere for life. ✔ATTENTION: Icicle product is of high and reliable quality but maybe plagiarized by others. In the interest of you and us, Plz double checking you are making purchase in Icicle online store, we can't guarantee the quality of fake products otherwise. If you spot the words"NEW FROM"on the right side of the Pics, click to enter the purchasing page, where you can choose Icicle direct to place order. If you have received a counterfeit product, actions should be performed: Contact Amazon and us!